It is the most splendid monument in Fatehpur Sikri built as the shelter to royal ladies and mistresses. This five storied building offers a picturesque panoramic view of the surrounding area. Inspired by Buddhist style of designing, this building was constructed by Akbar for the purpose of entertainment and relaxation. The columnar building has 4 floors and is constructed entirely in descending order. The entire building is supported by 84 pillars on the ground floor. The pool located in front of the building called as the Anoop Talao was constructed for the purpose of musical performances during the time of Akbar. Timing: All days of the week from 7:00 AM - 7:00 PM. Free for Children below 15 years. 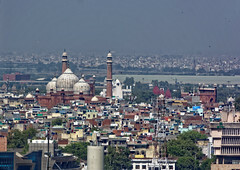 Address: State Highway 45 - Fatehpur Sikri, Agra, India"